When are mental health professionals asked to get involved? From a mental health professional who is also a service dog handler. A client may come to your clinic looking for you to complete a letter. You should inform the client that you would have to complete a full assessment and give a diagnosis prior to writing a letter for the client. This may take more than one session. If a diagnosis is not present, the individual does not qualify for a service animal or emotional support animal. Do evaluate the client using standard diagnostic assessment. Do not refuse to write a letter altogether. This would be a one-size-fits-all approach to an individualized issue. The difference between the three types of support animals (as referenced in the graph on this page). There are no certifications necessary for these types of animals (service/emotional support). 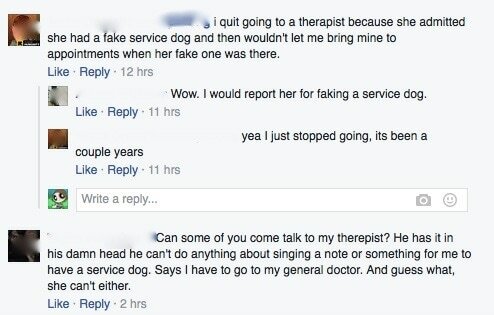 Don’t fake a service animal. There is a significant cost to service and emotional support animals in terms of taking care of basic needs. Service dogs have extensive training which can cost thousands of dollars. You cannot refuse entrance into the clinic. Similarly, welcome the handler and animal into the office in the future. If you, another patron, or someone in your office are allergic to animals, you do not have the right to refuse entrance or ask the handler to leave their animal at home. To verify that the animal is a service animal, you can ask two questions: 1) Is that a service animal? 2) What service does the animal provide? Do not ask the handler about their disability unless it is standard in the diagnostic interview. You may want to let the handler know that you are asking standard questions that are asked of everyone. If an animal is acting erratically or aggressively, you reserve the right to ask the handler to remove the animal from the clinic. If you have seen the client and believe that they can benefit from a service animal or emotional support animal, write a letter! If you have hesitations about whether or not the client can adequately care for a service animal or emotional support animal, have a discussion with the client about that. While it is not the mental health professional’s duty to determine whether or not a client is able to adequately care for the animal, there are times where they know the client well enough to discern whether or not the client can pay for the necessary care of the animal and/or whether or not the client would be a faithful human to their animal (and not abuse/neglect the animal). Require special identification for the animal. Require the animal to wear a vest. Ask about the person’s disability. Charge additional fees because of the animal. Refuse, isolate, segregate or treat this person less favorable than others. Address the dog instead of the handler.